The Lesser Quarter (Mala Strana or The Little Quarter). 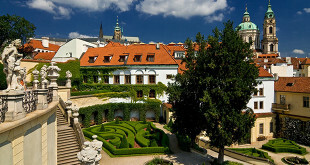 The origins of this picturesque district, located beneath Prague Castle, date back to the mid-13th century. After the foundation of the town, the original settlers were replaced by colonists of mostly foreign nationalities. 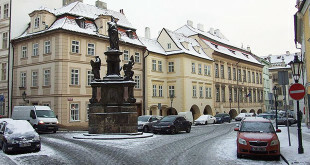 Charles IV extended the minor town of Prague with other plots of land but the town remained – thanks to several great fires as well as other events – more backward in respect of its economy than, and politically dependent on, the towns on the right bank of the Vltava. From the 16th century, feudalists and church elders, who gave this part of the city its present appearance – and not only an architectural one – gradually started to settle here. This quarter is just beneath the castle and is distinguished by the green of its gardens and orchards. The area is full of splendid palaces built by leading noble families and aristocrats. 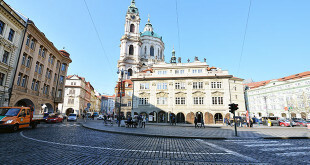 The Lesser Quarter Square is dominated by St. Nicholas Church, an example of the baroque style. Steep Nerudova Street leads to Prague Castle.